With some reluctance we gave up trying to chase the rich but plunging zone in the SE corner of the room we had now dubbed the Pink Room. ( See April-June page 3)To access this rich area we would have to go to the deepest part of the mine and again mine eastward. We next turned our attention to exploring the remnants of pocket 2 first discovered in May. Pocket 2 had produced some exceptional crystallized pink quartz on smoky quartz. 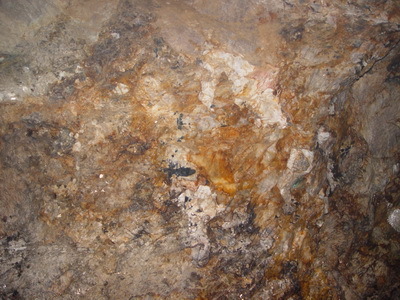 The participants of the 2007 Maine Pegmatite Workshop had opened a continuation of this pocket. 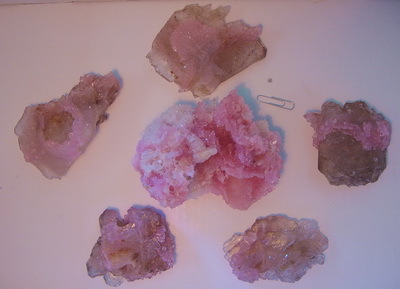 In the continuation they had also recovered some nice pink quartz specimens. We were hoping there might be still more to its story. We spent about two weeks working the pocket and the surrounding area. Though we did find a few more small cavities associated with pocket 2, the best had been mined early. As we did this work, it became clear to us that pocket 2 was oriented on the descending face of the plunge that had halted our work in the SE corner. Next we advanced the working face both north up through the plunge and westward along the plunge. The western section was quite well mineralized however the northern part of the advance was somewhat poor. Despite this paucity, we did another burn to the north and expanded it across the entire northern face of the Pink Room. Here we faced the opposite problem we faced working the SE corner. 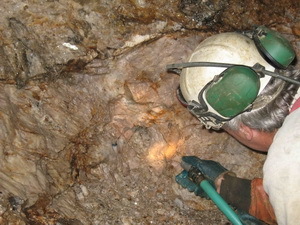 The mineralized zone proved to be in the top third of the working face. In fact, we blasted it all out in a single round. 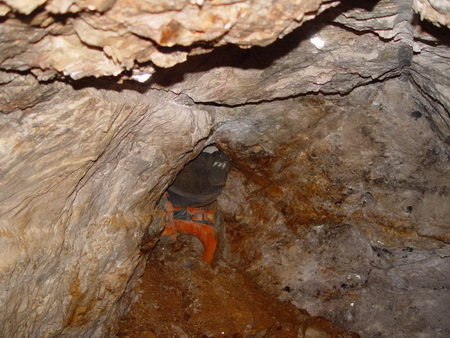 This mistake, no doubt, enriched the dumps as the muck created was full of rusty quartz and lepidolite. We tried to pick through rubble as best we could but it was an impossible task. On the westward end of the advance we could see that the mineralization was especially strong. Lepidolite, montebrasite and spodumene were intermingled within masses of milky quartz. There was the occasional blue-green tourmaline locked in matrix. Also locked in matrix was a tabular white beryl. We had only seen tabular beryls in pockets at Mount Mica. Those locked in matrix were either pale green or pale blue elongated on the C axis in the usual fashion. Despite the promise provided by tabular beryl there were no true cavities. Small vugs were abundant and probably the result of replacement. We estimated, based on measurements both above and below ground and extended from the various vent holes, that this enriched area was about 6-10m south of Merrill’s pocket of 1903. We decided to investigate this area more thoroughly later. There were limits to the amount of expansion the structural integrity of the Pink Room would allow. Frank Perham weighed in with a few observations. 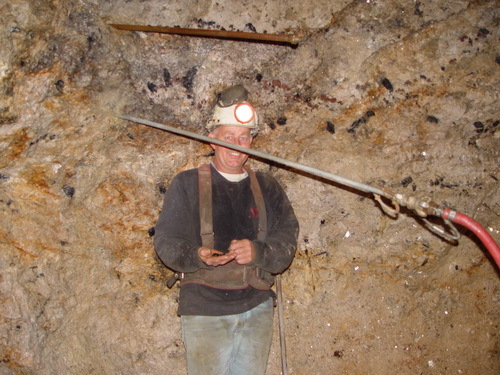 First, he noted that Merrill had been sufficiently impressed by the mineralization he was observing in his eastern pit to take the extra step to work deeper by employing cribbing. With this cribbing, a wooden wall to retain the dump from collapsing into the excavation, he as able to work still further as the pegmatite descended relentlessly deeper into the hill. 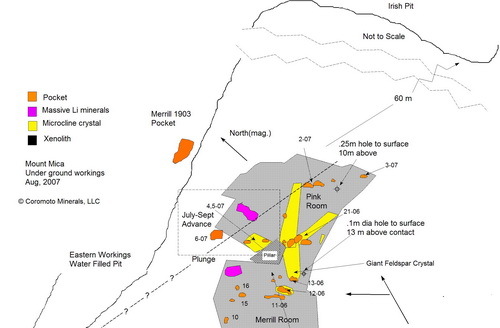 Frank also felt that in the eastward direction, towards the Irish pit, the pegmatite would loose its lithium component and grade into a simple pegmatite. That, of course, is one of the pivotal questions for the long term of Mount Mica as a tourmaline bearing pegmatite. As the current tenant at Mount Mica, I have not whole heartedly adopted this somewhat pessimistic view. It was gradually beginning to sink in that the better pockets we were finding were somehow associated with the descending face of the plunge. 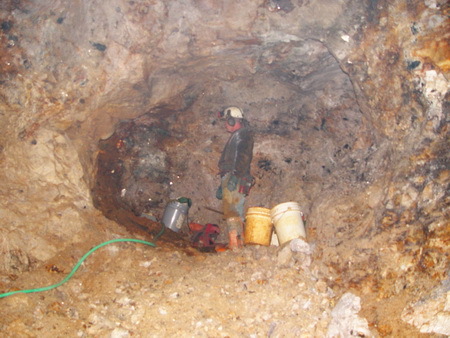 An advantage of mining underground is the opportunity to work in almost any direction. With the outline of the plunge clearly delineated in the western face of our advance, we decided to work in a northwesterly direction and as close as possible to the point at which the mineralization vanished into the ceiling. We’d work this zone down dip to as near as possible to the Merrill Room. However, we decided it would be prudent to leave some pillars between the Merrill Room and our new advance to provide roof support. As we advanced off to the northwest we immediately struck a very large mass of lepidolite. We knew by then, based on prior experience, we would not find pockets in the immediate vicinity of the lepidolite but further along there would be significant pocketing. The lepidolite masses, as logic would suggest, are probably the byproduct of the intensification in mineralization that is necessary to form significant pockets. Just beyond the lepidolite we encountered another encouraging sign. The microcline feldspars were becoming quite blocky and were infused with albite giving them the ‘zebra stripe’ appearance we had first seen as we approached pocket 21-06. We worried, however, that these signs might just be the up dip mineralization associated with pockets we had already found, principally 21-06. Only rock removal would yield and answer. As we advanced along, the southern side (down dip) of our extension continued to show small vugs and a line of tourmaline druse. On August the 17th we opened a very small space that contained a few small blue tourmalines of no consequence and a little lepidolite and clevealandite. The space had held water. The water had spilled out after the blast leaving small bank of cookeite. In spots the western working face was weeping water as well. We did a few probing horizontal drill holes to a depth of a meter or so hoping to intercept a space. Though we did not enter a space, we did manage to increase the water flow. If we plugged one of these drill holes it soon filled completely with water. We knew just to our right (north), by about 8-10m, was the eastern pit. So, the fact that we were seeing water was not altogether surprising but it does, however, require a conduit through which to pass. 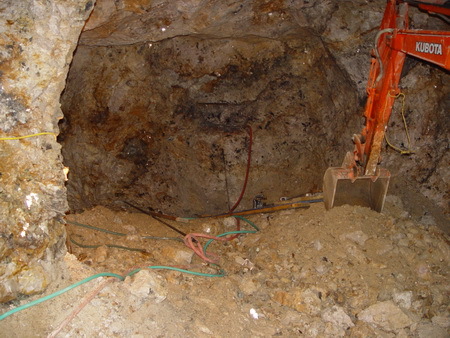 We had installed an electric pump in this pit to make sure that it was as dry a possible. This, presumably, lessened the hydrostatic pressure. A miner needs hope (delusion?) during the unproductive periods. ( July and August had been quite unproductive. ) Naturally, we hoped a pocket, or pockets, was the plumbing through which this water flowed. The constant reminder by ‘guests’ that our ‘hope’ water was merely just the leaching from the upper pit was not always encouragement. After several days the exploratory drill holes we had made ceased their strong flow and settled down to a slow weeping. We interpreted this to mean, following our optimistic line of thinking, that the source from which this water emanated had been drained and therefore must be a good sized pocket. A view into the widened advance after pocket 5. The floor is piled high with muck to enable us to drill high on the wall. Some of the tourmlaine crsytals ejected from pocket 6. The next day we started the burn at about the same height but 2m to the right (up dip). The drilling went well but the blasting not at all. We were left with our burn pattern and little rock movement. Even though we drilled a couple more holes, it took us several attempts at blasting to finally achieve a decent burn. Even expanding the burn did not go smoothly. We excused our poor performance by blaming the rock as being too compliant due to the nearby pocket. We rationalized the rock was ‘spongy’ and thus absorbed the shock of the high explosive without the required fracturing necessary to clear the burn…or something like that anyway. Finally, we were ready to do the critical drilling and blasting that would gain us access to the pocket. We knew it was probably a large one. 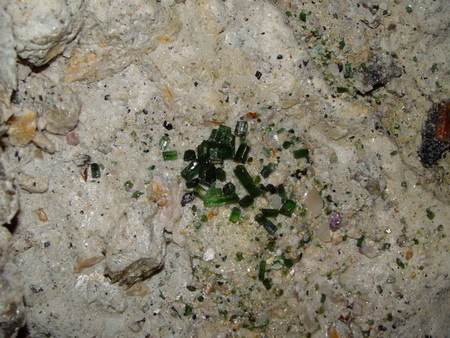 We knew also that it contained gem tourmaline. These facts gave strong incentive to be careful. On the other side of the ledger, we were expecting an important visitor so we wanted to have it opened in time for his arrival. On the morning of the 18th of September we drilled (3) ten foot holes placed at what we hoped was a comfortable distance from the pocket. The plan was that we would approach the pocket and make the final entry with hand tools. While Richard was drilling, I watched the penetration rate and quizzed him on the softness of the rock. We felt we were okay. The blast would pull to the space we had created to the left and not into the pocket itself. We should have shot the holes one at time. Instead we shot all three. Returning after the shot my heart sank as I saw pocket material spilling from a hole in the left wall. We had blasted into it. The hope now was that we had only inflicted a grazing wound. In the image, once some of the debris had been cleared, Richard crawls in to inspect the pocket.